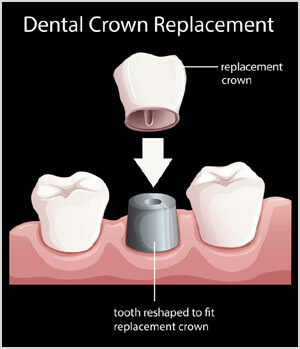 A crown is a restoration that covers, or "caps" a tooth to restore it to its normal shape and size. A crown can be used to strengthen and improve the appearance of a tooth; support a large filling when there isn't enough of the tooth remaining; attach a bridge; cover badly shaped or discolored teeth; protect or restore fractured teeth. A bridge is a dental appliance that replaces one or more natural missing teeth. A fixed bridge is usually a false tooth cemented to two existing natural teeth. The natural teeth are crowned to attach the false tooth. Unlike removable partials, a fixed bridge cannot be taken out of the mouth by the patient. A fixed bridge is great for maintaining good oral hygiene practices. If the space left by missing teeth is not filled, your remaining teeth may shift which will result in a greater risk for tooth decay. It can also change the appearance of your facial features causing premature wrinkles and age lines. Forms maybe requested by emailing crestwoodinf@crestwoodcomprehensivedental.com .